Many dogs struggle to stay relaxed when they see another dog, a person, or a specific environmental stimulus, and end up reacting with an intense stress response. Stress responses can be categorized into fight (such as barking, lunging), flight (such as avoiding, hiding), freeze (such as cowering, shutting down), or fool around (such as jumping, mouthing) behaviors. The Engage-Disengage Game is helpful for dogs that respond with a "fight" or "fool around" response. These dogs often become over-aroused quickly and end up hurling themselves toward the trigger out of fear, anxiety, or frustration. Unlike socially savvy dogs that self-interrupt frequently in order to keep interactions fun and safe, these "fight" or "fool around" dogs have immense difficulty disengaging from the trigger in order to self-interrupt. The Engage-Disengage Game decreases a dog's stress around the trigger and teaches the dog the peaceful coping skill of self-interruption. This ability to disengage and self-interrupt is similar to the practice of mindfulness, if you are at all familiar with Buddhism, yoga, or elements of the field of psychotherapy. If your dog has bitten or caused injury to a person or another animal, first consult with a certified positive reinforcement trainer or board-certified veterinary behaviorist to make sure you are implementing the necessary safety precautions. Reducing aggression, reactivity, or fear means desensitizing and counter-conditioning your dog to like the trigger gradually, and teaching an alternate response behavior. The Engage-Disengage Game uses positive reinforcement methods and provides a structured way to reduce a stress response and train a safe and appropriate behavior instead. There are two levels to the game. The first level rewards the dog for engaging with the trigger when he is not showing the stress response, which builds positive feelings toward the trigger. The second level rewards the dog for offering the alternative behavior of turning away from the trigger, which is a behavior incompatible with barking at, pulling toward, or biting the trigger! The illustration on the right explains how to play the Engage-Disengage Game. This illustration can also be downloaded at Choose Positive Dog Training. Practice fast U-turns by luring your dog by placing a treat near or on his nose or by tossing "find-it" treats on the ground as you both change direction quickly (walking toward the treat). Take a break if you notice even subtle stress signals (displacement behaviors) such as excessive lip-licking, yawning, or scratching. by looking at the trigger. Start at a safe distance away from the trigger, a place where your dog is not reacting. Be quiet and still so that your dog notices the trigger on his own. At the precise moment your dog ENGAGES by looking at the trigger, CLICK. When your dog turns his head toward you after hearing the click, feed him a treat. If your dog reacts or does not turn back to you after the click, move further away from the trigger to reset at an easier distance. The goal of Level 1 is to succeed with at least 3-5 repetitions in a row at the same distance before moving on to Level 2. A successful repetition is when your dog turns back to you immediately after the click. If the trigger is moving or changing in intensity, keep playing Level 1 until your dog has calmly looked at or engaged with the trigger from every direction. THEN move on to Level 2. Again, let your dog notice the trigger, but this time wait 1-5 seconds to see if your dog will offer to look away from the trigger on his own. If your dog is fixating on the trigger for longer than 5 seconds, go back to Level 1. At the precise moment your dog DISENGAGES by looking away from the trigger, CLICK. After the click, feed a treat. If your dog reacts or is not turning back to you after the click, move further away from the trigger to reset at an easier distance. The goal of Level 2 is to succeed with at least 3-5 repetitions in a row before moving 1-5 steps closer to the trigger. A successful repetition is when your dog disengages with the trigger comfortably on his own. As you move closer, keep playing Level 2 if the trigger is not moving or changing in intensity. If the trigger is moving or changing in intensity, go back to Level 1 at the new distance. Each time you play the Engage-Disengage Game, play for 1-5 minutes, and then take a break. If your dog is ready and eager, you can repeat this pattern. Remember to keep your goals realistic. For example, if your dog is triggered by other dogs, it is important to acknowledge that he may not be destined to be a "dog-park dog." Some dogs may simply prefer the company of humans more than other dogs, or may not enjoy physically interacting with dogs that have different play styles. Some dogs may have more introverted social personalities. Going to the dog park or walking through a busy crowd of people can be like a rave or punk concert that your dog is just not interested in attending! Instead he may prefer to snuggle down next to you on the couch—like when you settle down to read a good book or watch a movie. 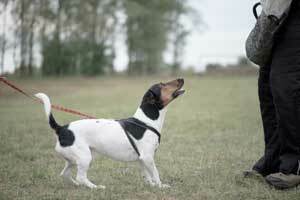 Remember to take training at your dog's pace and to make things easier if he is showing stress signals. In many cases, working your dog up to walking by another dog or person calmly on-leash is a perfectly acceptable goal for both of you. As a responsible dog parent, it is important to have expectations that respect your dog's capability and personality. Remember to take training at your dog's pace and to make things easier if he is showing stress signals. Keeping your dog under threshold will actually help him learn faster and give you longer-term results. If it is appropriate for your dog to engage in polite greetings and physical interactions with the trigger, you can still play the Engage-Disengage Game by clicking for more interactive "engage" behaviors, such as sniffing the trigger or targeting a safe area of the trigger with nose or paw. A certified positive reinforcement trainer or board-certified veterinary behaviorist can help you determine if greetings and physical interactions are appropriate for your dog, and can also assist in creating an individualized greeting plan that prioritizes safety and success. 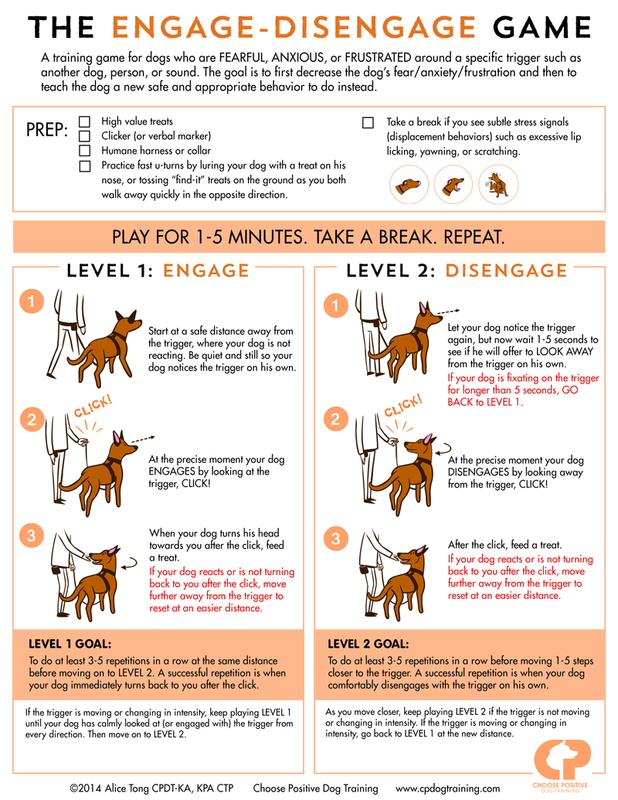 Using positive reinforcement methods like the Engage-Disengage Game, help your dog become less anxious and fearful of the world. The Engage-Disengage Game can come in handy for many situations. I have used it to teach dogs how to remain calm and happy around a new baby in the home; around other dogs or people they are scared of; around other dogs or people they love so much that they want to jump and mouth; around bikes, skateboards, doorbells—and the list continues. Science and research in dog training have revealed that intimidation, pain, or the threat of pain are simply not necessary and cause more problems training an aggressive, reactive, or fearful dog. 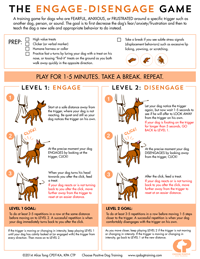 Instead, using positive reinforcement methods like the Engage-Disengage Game, help your dog become less anxious and fearful of the world, and teach him that he has the ability to choose another behavior that is both fun and safe instead. 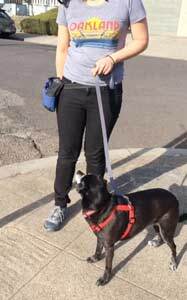 Alice Tong, KPA CTP, LCSW, provides private training services through her business Choose Positive Dog Training. 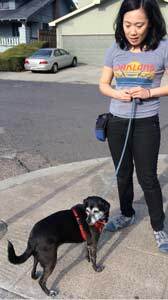 A licensed clinical social worker, Alice is skilled at reading and assisting humans and dogs of all personalities. Her focus is always on positive methods, respectful communication, and high-quality service.